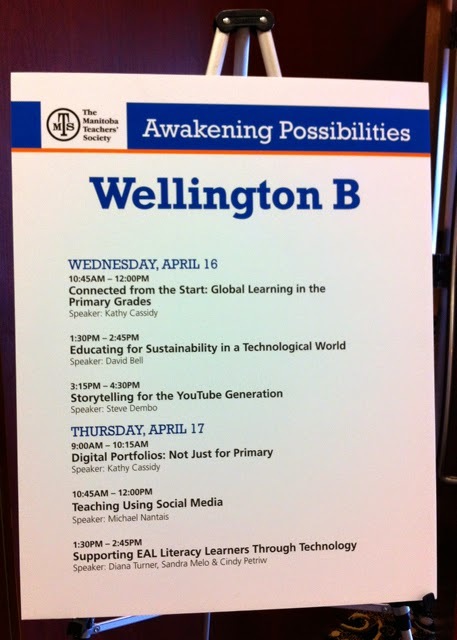 On April 16 and 17, I was fortunate to attend and present at the Manitoba Teachers' Society's educational technology conference called "Awakening Possibilities". This conference was geared toward K-12 educators, in the past 6 years most of the conferences I attend are usually academic ones or ones with a more mixed audience. I was asked to present on my dissertation research, the organizers wanted some sessions based on research. My slide deck was very similar to the one I used at the National Congress on Rural Education a few weeks earlier - it is embedded in that post, so I won't embed the new one here. It can be found on my slideshare page if interested. I must say, I was pleasantly surprised at the number of people attending my session, but the topic was about using social media in the classroom - from the teacher's perspective. It went well, I think. Near the beginning I ask "What is social media?" the very definition is a confounding factor in doing research in this area. This led to a good discussion and points made - not all I agreed with, but good none the less. The rest I went through the purpose, findings and some conclusions from my study. Now - back to the conference. It was one of the best I have attended, I actually wished I was still teaching in K-12 so I could try some of the ideas presented with kids. But alas, I will have to settle for using the ideas and examples presented in my teacher education courses instead. The number of tremendous educators and projects going on in Manitoba (and SK, in the case of Kathy Cassidy) schools is inspiring, it was too bad I had to pick some sessions over others. The tweets were also going fast and furious - which helped get a sense of other sessions going on. The keynotes, opening by Steve Dembo and closing by Chris Lehman were excellent, as were the IGNITE sessions held in the evening. Many of those were by students, all so intelligent, funny, & inspiring. Some photos and video clips from the conference can be found on the MTS Facebook page. Kudos to the organizers and MTS for putting on this excellent conference!